It is a known fact that mother’s milk is the best for a newborn baby. So even before I got pregnant I knew that I was going to breastfeed my baby. I was watching a lot of youtube videos, reading stories of other moms and gathering the information. I wanted to be prepared for everything. So today I will share my story and review two different breast pumps which I used. If you’re interested – just keep reading. First three months I was breastfeeding exclusively but later on I decided to invest in a breast pump. Why? Just because I needed to be able to go out and leave my baby with my husband. 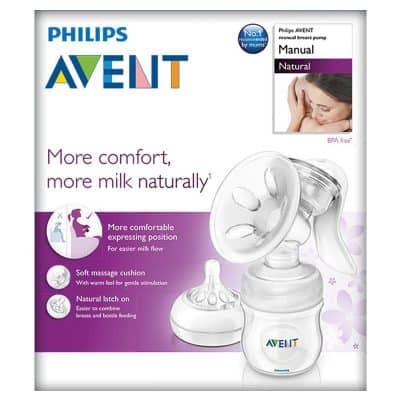 After my research I decided to buy Philips Avent manual breast pump (Natural). I’ve read a lot of great reviews about it and it wasn’t the most expensive choice so I decided to just go with it. In first tries of pumping I produced only about 50ml from one breast (on a good day) so that got me worried. I started thinking that maybe I’m not producing enough? Then I got on the internet again and found out that the amount of milk you pump might be a lot different than the baby gets. Using Avent manual pump seemed ok, it wasn’t hard, well maybe my hand will get tired after some time but I could deal with that. The package of this breast pump contained to bottles, which were working amazing because my little girl took them with no problem at all. So I was happy with that. Still, I was worried about the amount of milk I’m producing and I wanted to find a better solution. Then I tried massaging the breast before and during the pumping which helped but didn’t make a big difference. Pumping was time consuming and after a lot of work the amount just wasn’t enough for one feed. The whole pumping process is pretty long (in my case). At that time I understood that one pump can’t suit all women and I needed to try something new. I was ready to invest more money to a breast pump which actually worked and gave better results. To achieve that I bought Medela Swing breast pump, which had just amazing reviews all over the internet. My experience with Medela was a lot better. Why? Pumping was a lot easier because I could focus on massaging my breast to express more milk, rather than pumping manually. Using this breast pump I would get the same amount or more in a shorter period of time. Also I have to point out that I was pumping only after my baby went to sleep at night, after few hours. I did that to be sure that my breasts were full. 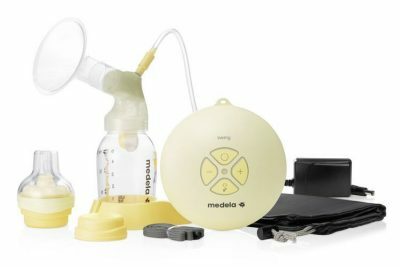 Medela pump was just a life saver just because sitting and pumping for an hour at night, when you could be sleeping, isn’t the best scenario, so I was happy about my decision to invest in this pump. In the reviews that I read about it, I saw some people complaining about the noise that it makes while working, but I have to say that it’s really nothing. In my opinion it’s quite and very effective. Control panel gives you an opportunity to choose pumping speed and level which is comfortable for YOU. I didn’t find any 🙂 Well maybe the price, which is a little bit bigger, but in my opinion it is worth every penny. I hope this review – comparison was helpful for you and if you have any questions, leave them below and I will get to you! Great post OP about breast pump. I also have Medela Swing pump and I’m verry happy, this breast pomp is amazing works with no truble all the time, I’m using it with third my kid.